Help : The aging report allows you to report on Open Items (Invoices). Select the aging buckets, you want to have in your report. If you select a currency, you get only invoices of that currency, otherwise the amounts are converted to your primary accounting currency. 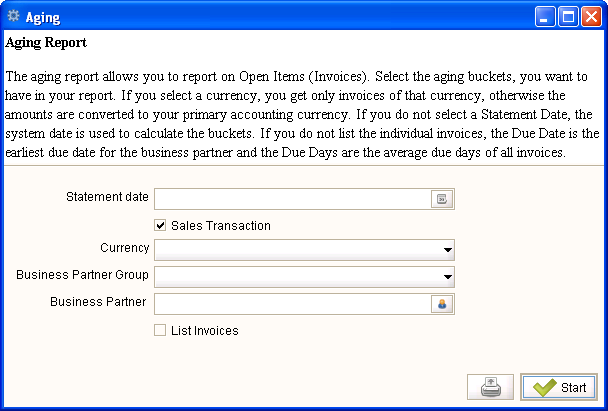 If you do not select a Statement Date, the system date is used to calculate the buckets. If you do not list the individual invoices, the Due Date is the earliest due date for the business partner and the Due Days are the average due days of all invoices. This page was last modified on 15 May 2007, at 15:20.